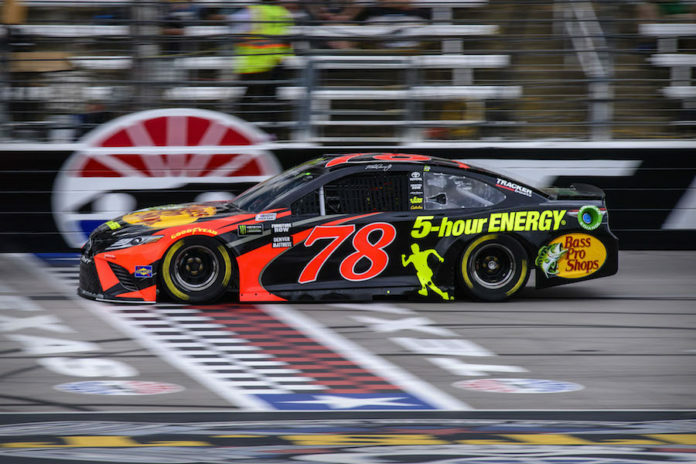 Martin Truex Jr. will start sixth in Sunday’s O’Reilly Auto Parts 500 after lightning in the area forced NASCAR to cancel the final two rounds of qualifying Friday at Texas Motor Speedway. Truex’s No. 78 Bass Pro Shops/5-hour ENERGY Toyota ran a lap of 27.554 seconds at 195.979 mph in the first and, ultimately, final round of qualifying on the 1.5-mile tri-oval. The Furniture Row Racing driver will line up on the outside of Row 3 for the 334-lap, 501-mile race. Truex finished eighth in last year’s spring race and was runner-up last November. Kurt Busch earned the pole. The balance of the top 12 qualifiers were: Kevin Harvick, Clint Bowyer, Ryan Blaney, Denny Hamlin, Truex., Joey Logano, Kyle Busch, Jimmie Johnson, Kyle Larson, Brad Keselowski, and Aric Almirola. Sunday’s O’Reilly Auto Parts 500 will air live beginning at noon MT (2 p.m. ET) on FS1, SiriusXM NASCAR Radio Channel 90 and PRN.